This post made me smile. Such wonderful simple pleasures. And I could almost hear the rushing water. That is no small thing. More people should be that way. 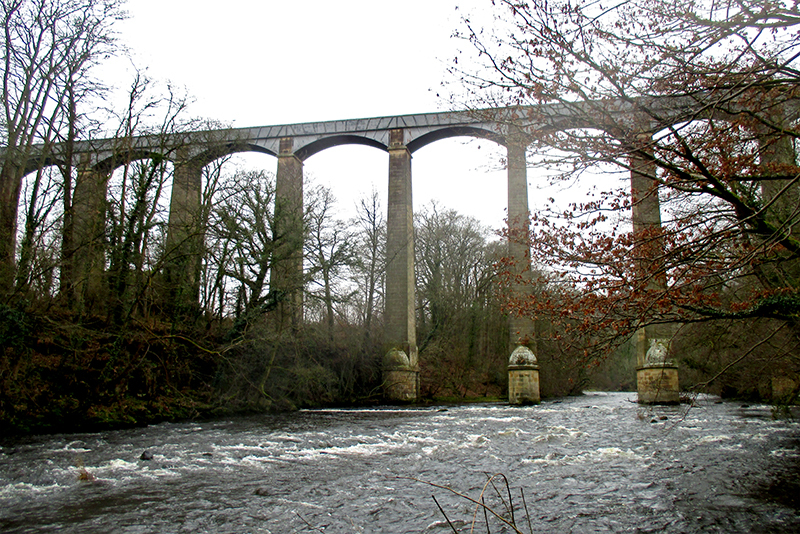 Imagine what it is like going over the Pontcysyllte Aqueduct in a boat. As I recall, from very long ago, you can’t even see the metal boundary to the channel on the left hand/port side. I cut the grass today (should have done it late autumn). At last it was dry enough to do so with my human-power mower. You are well ahead of the game. If I took a mower out now, I would just be pressing moss. A veritable feast of interesting photographs, my favourites were the robin and the cascade. Am eager to know what is wrong with your foot, glad the appointment is soon! I love all the little rolls and waterfalls that lead to the big river. There is NO way I would have crossed that aqueduct. The catkins on the left look like hazel, but I don’t recognize the ones on the right. I agree about how surprising it is to think that the little tributaries make up such a big river. The same thing happens here. That yellow / orange lichen on the right looks like one of the sunburst lichens, maybe poplar sunburst or the elegant sunburst. The ones on the right are alders but it was not a very good picture. I am sure that the lichen is xanthoria parietina. It likes conrete posts. The blackbird looked interested in what was going on. A few and rather battered but very welcome all the same. A beautiful assortment of birds and late winter flowers from your area. Our own native robins, Turdus migratorius, are back in large numbers now. We are back to rain, for now, and the thin covering of snow has melted. Our daffodils are having a similar problem holding their heads up after being weighed down by icy snow. Good luck with the physiotherapist. I hope they can fix your foot. I have great confidence that she will at least be able to tell me what is wrong and that will be a good start on the road to recovery. Loved the robin picture and also the cascade. Dropscone is a brave fellow. Serious amounts of water. We find mostly it’s not what falls on you that matters, it’s what falls upstream that can cause the problems. That is true. Although short, the Wauchope has about 40 sq km of catchment area. I am confident of one…..fairly. The map is such a great idea together with the markers and photos. The birds look bright and cheerful with that sunbeam of sunshine on their feathers. Love that little robin and siskin. I hope we get a few more siskins. Usually we have dozens. Good to see you out and about again! I very much like your favourite little cascade! And the tour was delightful. Thank you. I was pleased to get some fresh air.